George-Valentin Bibescu (March 22, 1880, Bucharest - July 2, 1941, Bucharest), was a Romanian early aviation pioneer. Bibescu was Grand Master of Romanian Grand Lodge from 1911 to 1916. Prince George III Valentin Bibescu (Bibesco), nephew of Gheorghe Bibescu, ruler of Wallachia, was born in Bucharest. In 1902, he married Marthe Lucie Lahovary, who took the name Marthe Bibesco. They had one daughter, Valentina, born 27 August 1903. In 1912, he gave his wife as a present the Mogosoaia Palace. Bibescu had an early interest in aviation; he flew a balloon named "Romania" brought from France 1905. Later he tried to teach himself how to fly a Voisin airplane, also brought from France, but without success. After Louis Blériot's demonstrative flight in Bucharest on October 18, 1909, he went to Paris and enrolled in Blériot's school in Pau. 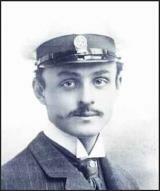 On January 23, 1910, he obtained the International Pilot License number 20. After returning from France, Bibescu organized the Cotroceni Piloting School in Bucharest where Mircea Zorileanu and Nicolae Capsa were licensed. On May 5, 1912, he founded the Romanian National Aeronautic League. He was instrumental in founding the Fédération Aéronautique Internationale (FAI). Between 1927 and 1930, he was vice-president, and between 1930 and 1941 president of the FAI. He was co-founder of the Romanian Automobile Club (1901), and of the Romanian Olympic Committee (1914). Romania was among the first 6 nations in the world to organize car races. In 1904, he won the Bucharest-Giurgiu-Bucharest auto race, with an average hourly speed of 66 km/h. In 1905, motorists George Valentin Bibescu, Leon Leonida, and Mihai Ferekide, accompanied by Marthe Bibesco, Maria Ferekide, and Claude Anet, made the first automobile trip to Persia, leaving from Galati and reaching Ispahan. The trip is described by the French writer Claude Anet in his book, "La Perse en automobile à travers la Russie et le Caucase (Les Roses d'Ispahan)". George Valentin Bibescu is the founder of Baneasa airport in Bucharest, which was builded on the former estate of her aunt, Maria Bibescu, Countess of Montesquiou Fezensac. Prince George Bibesco is buried in the small, white 1688 church on the grounds of Mogosoaia Palace in Romania.